It's no secret that many of those cotton t-shirts we wear here in the First World ultimately get donated and wind up in the Third World. Thousands of t-shirts that get printed each year celebrating the losing team in the Super Bowl, NBA Finals and World Series usually get shipped to Africa. And for decades the customary bar mitzvah and bat mitzvah t-shirts that accumulate in teens' closets have been donated to the Salvation Army or Goodwill to be sent to Africa or into impoverished neighborhoods throughout North America. When I lived in New York City, it was not unusual for me to see a homeless man wearing a donated bar mitzvah t-shirt or a Jewish youth group shirt that had been donated before the owner went off to college. National Public Radio (NPR) did a story the other day on the fate of these donated t-shirts that wind up in Africa. It wasn't the first time such a story had been done. Almost three years ago Mother Jones ran a story titled "When Hooters T-Shirts Go to Africa: Donate an old t-shirt in the US? Someday it might travel to a country like Liberia." And over ten years ago the New York Times published a story that also tracked donated clothes to the Third World in George Packer's article "How Susie Bayer's T-Shirt Ended Up on Yusuf Mama's Back." The basic premise of these stories is that once you donate an old sweatshirt or t-shirt to the Salvation Army or Goodwill, your old, used clothing takes on a new life somewhere else. We often don't think of who's wearing our old winter coat that we donated, but it does make for an interesting story. So NPR, as part of its Planet Money T-Shirt Project, decided to post some photos of donated t-shirts in Kenya that are now for sale and ask if anyone knew to whom they had once belonged. The first photograph in NPR's Is This Your Old T-Shirt? 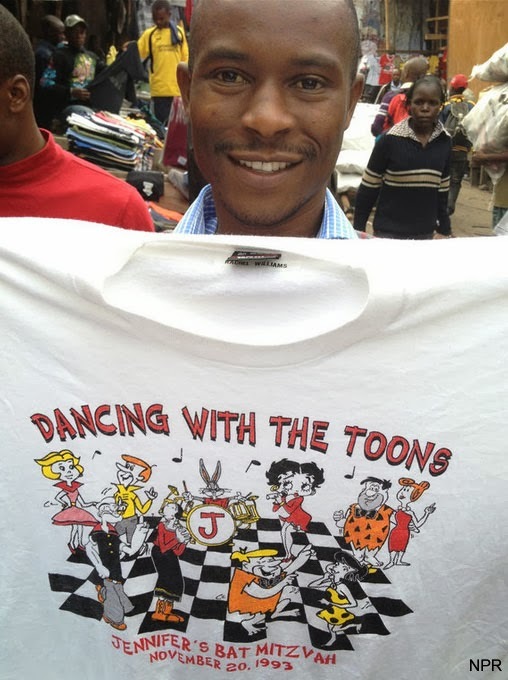 (It's For Sale In Kenya) was a bat mitzvah t-shirt with the Flintstones and Jetsons cartoon characters dancing that said "Jennifer's Bat Mitzvah" and dated November 20, 1993. NPR wanted to find out who Jennifer was and who had donated the t-shirt in the first place. The t-shirt had a tag sewn inside that read Rachel Williams -- not surprising as it was likely worn at a summer camp where clothing gets labeled like that. Anyone who heard that NPR report or saw the online slideshow of photos wondered if they might know Rachel or Jennifer. Last week, Gregory Warner and David Kestenbaum reported on the after life of American clothes–namely how clothes we outgrow or get tired of end up in bins in sub-Saharan Africa. Through out their rummage, they found this gem from Jennifer’s bat mitzvah, dated November 20th, 1993. The question they desperately want answered (as do we): WHO IS JENNIFER? The shirt had a tag sewn inside (most likely from the clothes-labeling days of Jewish summer camp) that reads Rachel Williams. Do you know Rachel? Do you know Jennifer? Help these two guys solve this bat mitzvah mystery! Email planetmoney@npr.org and put “that’s my shirt” in the subject line. Let the Jewish geography conversations commence! It turns out that the t-shirt had a local Detroit, Michigan connection. 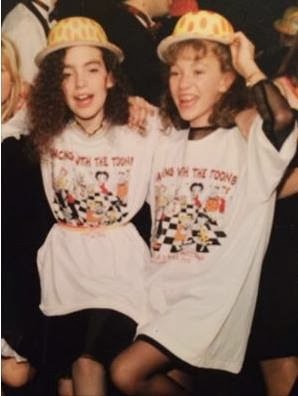 It was from Jennifer Slaim Rasansky's 1993 bat mitzvah and belonged to Rachel Williams, her friend from Camp Tamarack in Ortonville, Michigan. Adam Socloff, originally from Ann Arbor, reported the find in a JTA article posted last night: How Jennifer’s bat mitzvah T-shirt wound up in Africa. Jennifer Slaim Rasansky with Rachel Williams Aaronson at her bat mitzvah. While these stories have been done in the past, this one seems to have touched a nostalgia chord as everyone remembers the day mom donated their collection of bar mitzvah t-shirts. Hopefully this story will also encourage people to clean out their closets and donate gently worn clothing. It is a fantastic designable article which is very essential for me as well. I must follow the content as well. Keep it up.